Conventional financial “experts” (ahem) say, almost with a unified voice, that self-directed IRA’s are so dangerous that you shouldn’t use them. I, your humble host, say something entirely different: Don’t let their ignorance get in the way of building great wealth in your IRA through ALTERNATIVE investments! 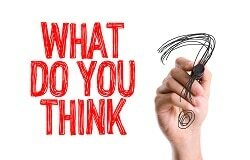 Today you learn question #1 of 3 simple questions to ask yourself which will virtually guarantee you’ll never face the ire of the IRS due to your IRA. I’m Bryan Ellis. This is Episode #268. Hello, Self-Directed Investor Nation! Welcome to the broadcast of record for savvy self-directed investors like YOU where each and every day, I teach you how to find, understand and profit from exceptional alternative investment opportunities! Today’s show is, of course, sponsored by the Self Directed Investor Society, America’s only private association for investors who prefer to TAKE CONTROL of their own investments, even when that means buying real estate, cryptocurrencies or other wild and wooly asset types inside of an IRA or 401k. 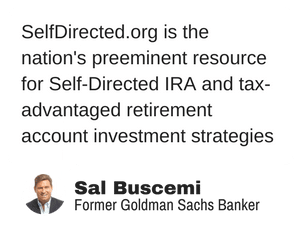 To learn more about the Self Directed Investor Society, visit SelfDirected.org. My friends, a few weeks ago I published an article in Forbes that created quite an uproar. It’s linked on today’s show notes page… and the basic idea of it is this: Conventional financial professionals are very negative on self-directed IRA’s, but the real reason is self-serving: The more you rely on self-directed investing options, the less the conventional financial industry stands to profit from you. Ah yes… thank you for that email reminder to listener Chris from Florida tell you the address for today’s show page. Today’s episode #is 268… and using our super-secret, highly-encrypted, total indecipherable formula, the page address we’ve come up with for episode #268 is SelfDirected.org/268. Hehehehe SelfDirected.org/268. That’s where the Forbes article is linked, and where you can interact with other listeners to this very show. So the primary critique those conventional types level against Self-Directed IRA’s is the DANGER and RISk… Invariably, they’re referring to prohibited transactions, that pesky set of rules that, if you break them, ARE in fact quite dangerous and risky. But here’s what they just don’t tell you… because they don’t know… the conventional folks are almost entirely ignorant of the actual rules about prohibited transactions… I can tell by their comments. But I digress. 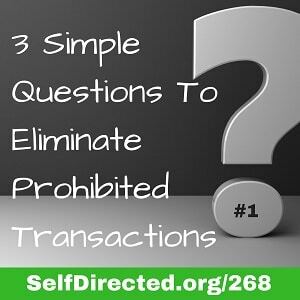 The truth is, it’s pretty easy to stay away from prohibited transactions. Yep… there, I said it. It’s EASY. All you need to do is ask yourself 3 simple questions. And today, my friends, I shall reveal unto you question #1 to set your mind at ease. That’s right, my friends… the IRS takes great offense if you reintroduce that partially consumed corn chip into the otherwise pristine bowl of salsa, or if you actually dare to re-dip the bitten end of that breadstick into the communal bowl of cheese dip. Well… I guess the IRS’ concern about double dipping is more metaphorical, because I did just run a text search of Internal Revenue Code Section 4975 that deals with prohibited transaction, and my to my chagrin, it turns out there’s nothing in there about double-dipping. But what is there is exactly the same thing. Consider this common scenario: You find a lovely vacation home. Maybe a beachfront condo in the exact location you’d love to retire. So you buy that condo. More precisely, your IRA buys that condo… and your plan is simple: When you reach retirement, you’ll have the IRA distribute that house to you, in which you’ll live happily ever after. In the meantime, though, you do something pretty smart: You hire a local property management company to rent it out for you in order to generate some income and cover your costs. Good idea. So far, so good. In fact, at this point, you’re already well into some great tax advantages for that property by way of your IRA. And you know what? The IRS is totally cool with that. Then, on a fateful Friday afternoon before a long weekend, you get a call from the property management company… the person who had rented your property for the weekend just backed out. Your condo will sit empty for the weekend. So what do you do? The only rational thing, of course: You knock off of work early, grab the spouse, and you head over to use the property for the long weekend yourself. Nobody else will be using it, and it’s the absolute best weekend of the year. You, of course, have a good time… a great time even. Problem is: You’ve broken the rules. You’ve double-dipped. “How, just how have I double dipped?”, you, the inquisitive listener may be wondering. Remember those wonderful tax breaks you’re getting because it’s your IRA that owns the property… the stuff about using pre-tax dollars to buy the real estate… the stuff about paying no taxes on income generated from that property… the stuff about maybe even paying no tax during retirement? Well, those are some big benefits. Really big benefits… and remember, the IRS is cool with that. Consider those benefits Dip #1 into the tasty salsa of IRA Benefits. …and to the IRS, whenever you start actually BENEFITING from the assets in your IRA in any way other than just the wonderful tax benefits you’re already receiving, then you’re double dipping. Double dipping is VERY BAD. Not only is it personally disgusting in a culinary sense, it’s economically disgusting, because when the IRS realizes you’ve done it, they’re going to declare your IRA as being “fully distributed”. I won’t go into the gory details of that, but let’s just say that the appropriate words to describe it are: Apocalyptic… cataclysmic… absolutely, positively disastrous. It’s brutal… and almost always irreparable. There’s a lot more information about this, and even a free eBook I wrote about this, over at the website… It’s linked on today’s show page at SelfDirected.org/268. So question #1 to ask yourself before EVERY SINGLE IRA deal you do is this: Am I double-dipping? If the answer is yes… or even maybe yes… or even indirectly, yes… run far, far away. You’re entering very dangerous territory. Otherwise, you’re good to proceed on to equally easy question #2 to make sure you don’t run afoul of the rules for IRA’s. Well, I’ll tell you. That information is on today’s show page at SelfDirected.org/268, SelfDirected.org/268. 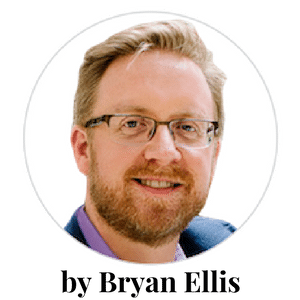 Bryan’s article on Forbes: Self-Directed IRAs Are Risky, But For Whom? How Do You Avoid Double-Dipping When Using Your Self-Directed IRA or 401(k)?